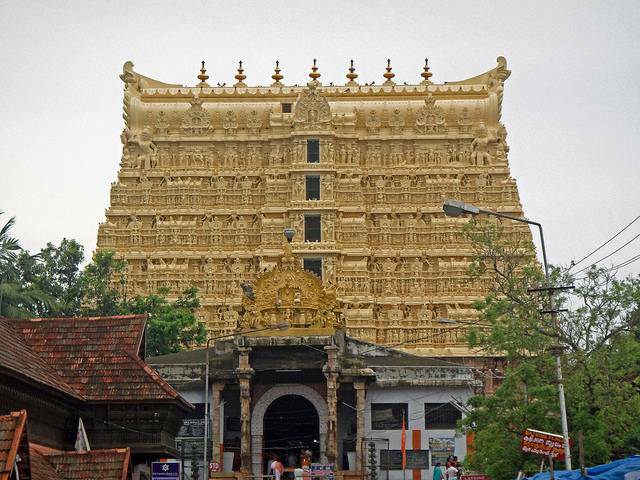 The supposedly world's richest temple Sri Padmanabha Swamy Temple is dedicated to Lord Vishnu and is the most important tourist attraction of the city. The name “Padmanabha Swamy” means “God with a lotus in his Naval”. The architecture is a typical amalgam of Dravidian and Kerala style. The mural paintings and stone sculptures are ethereal. The “Othakkal Mandapam”, a hall which is carved out of Single Rock is an interesting feature of the temple. The main deity in sanctum Sanctorum is Lord Vishnu reclining over a coil of Snake “Sesha”. After establishing the Kingdom in Travancore, Raja Marthanda Varma dedicated his life and Kingdom to Lord Padmanabha Swamy and become a servant (Padmanabha Dasa) for Lord Vishnu. The history holds the event as “Thrippadidanam”. This temple is located in the eastern corner of the fort. The temple is believed to be the richest in the world.The antiques and fortune are believed to be some billion US Dollars. Only Hindus are allowed to enter the temple. It is mandatory that the men wear Dhoti, without shirts and women wear a saree or "Paavada-shirt".